Back due to popular demand - Mike's is hosting a winter hunting archery league. Starting date will be January 2nd 2016. 8 targets to be completed by March 1st 2016. Junior shooters also welcome. Shooting can be done anytime the shop is open. Call the shop (610-759-2905) for details. 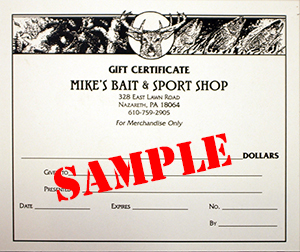 Mike's Bait And Sport Shop, founded in 1981, is open 7 days a week. We are stocked with hunting and fishing gear. We also sell dog, hunting and fishing licenses. We have indoor archery range and sell bait year round.